Providers in Florida are familiar with the DNRO (the yellow) form. This order directs EMTs, hospital or nursing home personnel, and others not to attempt resuscitating a patient if he or she experiences a cardiopulmonary arrest. It is appropriately ordered when a patient expresses a desire to forgo CPR, or when it is clear that CPR would not provide benefits to the patient. The Physician Orders for Life-Sustaining Treatment (POLST) form goes beyond that to include orders for a level of medical interven-tions and whether and how artificial nutrition will be used. 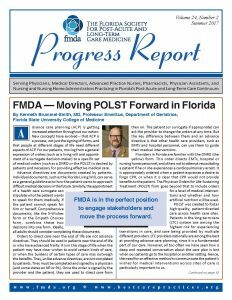 POLST was created to foster high-quality, patient-directed care across health care sites. Patients in the long-term-care (LTC) system are among the highest risk for experiencing transitions in care, and care being provided by multiple different providers. LTC providers nationally are among the best at providing advance care planning, since it is a fundamental part of our care. However, all too often we have seen how a deep and repeated conversation about the care plan is lost when our patients go to the hospital or another setting. Hence, the need for an effective method to communicate the patient’s wishes for medical interventions across sites of care is particularly important to us.